Artwork in the exhibit will be centered around the theme “seven.” Photo by Bailey Hovland. Art students from seven universities have worked together to compile an exhibit that will debut this Friday, Oct. 6, at the Plains Art Museum in Downtown Fargo. The exhibit and the subsequent print exchange have been coordinated by Amanda Heidt, print studio manager of Hannaher’s Inc. Studio at the Plains Art Museum, and Eric Johnson, master printmaker at NDSU. Participating students hail from the University of North Dakota, the University of Manitoba Winnipeg, North Dakota State University, Minnesota State University Moorhead, Concordia College, Minot State University, and Valley City State University. The exhibit is part of a larger event called Printober, a celebration of printmaking during the month of October. For this project, there coordinators choose the participating artists, the location, and the theme. This time, the theme is a number: seven. A prompt like this is meant to inspire a wide range of creativity; Brianna Borah, a graphic design major at Concordia, considers it a fun challenge. However, the number used for the prompt was not chosen at random. According to Heidi Goldberg, chair of the art department at Concordia, it was chosen because there are seven universities participating in the project. 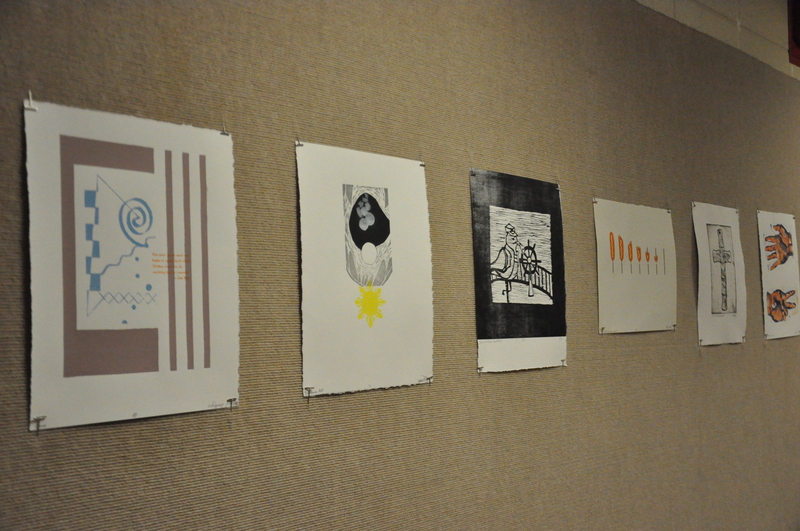 To make the exhibit even more rewarding, artists made 25 editions of their pieces to exchange with the other artists. 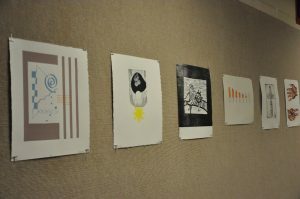 While the exhibit begins on October 6, the print exchange happens later in the month, during Concordia’s mid-semester recess. “As many people that can go will go, and we have the opportunity to hear from each other about the pieces that we did … the big deal for us will be on October 21st,” Goldberg said. According to Borah, the exchange is a key part of the project. Artists appreciate feedback; exchanging prints is one of the unique benefits of printmaking. “Exchanges and exhibitions are a part of the culture of printmakers and what we do. And so we’re always reaching out to share ideas … to have discussions about topics and you see that happening on a small level like this, and you see it happening in national conferences,” Goldberg said. This exhibit also provides a valuable professional opportunity to the student participants: their works will be displayed in the museum, and then an original print from each student will be kept at the Plains Art museum. “[The pieces] will technically be put into the permanent collection at that point as well, so they will have a piece in a permanent collection,” Heidt says. The students are excited knowing they will have something to put on their resumés. “Being able to say that I have museum status, even though it’s technically something small, to a lot of us it means a whole lot,” Borah said.